Dr. George Kanellakos, Geoff Dugas, David Wong and Peter Slinger of the Toronto General Hospital have made available online a Web-based Bronchoscopy Simulator at http://thoracic-anesthesia.com/. 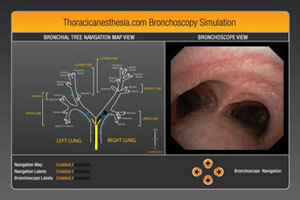 Ongoing access to the simulator is free to all interested persons after first registering and taking the initial "Bronchoscopy Quiz" Pre-test, also at http://thoracic-anesthesia.com/. 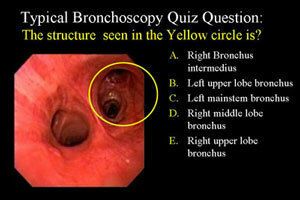 After using the simulator users are encouraged to take the Bronchoscopy Post-test after which they have confidential access to the correct answers, their scores and the mean scores of others taking the test with similar levels of bronchoscopy experience.